Plot Summary: While staying alone in his dormitory, college student Keiichi Morisato was trying to call some restaurants for delivery when he accidentally called the Goddess Help Line. 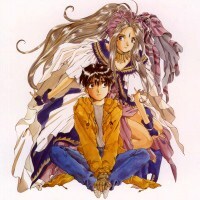 Suddenly, the mirror near him glowed and a beautiful goddess named Belldandy appeared out of it. She granted Keiichi his one wish for her to be his girlfriend forever. After being kicked out of the dorm, Keiichi and Belldandy now live in an old temple with her sisters Urd and Skuld.